So as I was tripping out my backdoor on Monday…and when I say tripping, I mean my foot got caught in the strap of a beach bag that had been sitting in the doorway for over a month…I decided that this was the day I was finally going to TaKe BaCk My HoUse! As you can clearly see from my before picture, possibly I have been spending a little too much time crafting, blogging, playing, facebooking, pinteresting, etc. and not quite enough time keeping things in order around here. I’m not sure if my foot in the beach bag was what pushed me over the edge or if it was the fear of my coffee spilling over, but who really cares…a two second incident was all it took to make me realize something needed to give. OK…looking at the before picture…LOTS of things needed to give! My husband was skeptical at first as he always is when I go on my organizing crazes, but I think part of him was also just happy that I was finally going through the gigantic pile of shoes, coats, and bags that had accumulated by the back door that he just humored me. With a little help from Target I am thrilled with the results and so are my kids. They love having their own cubbies to put their shoes in when they come home and it helps teach them to be responsible. A lot of the other stuff I used to spruce up the area I had lying around the house not being used. Even my husband was shocked at the transformation! 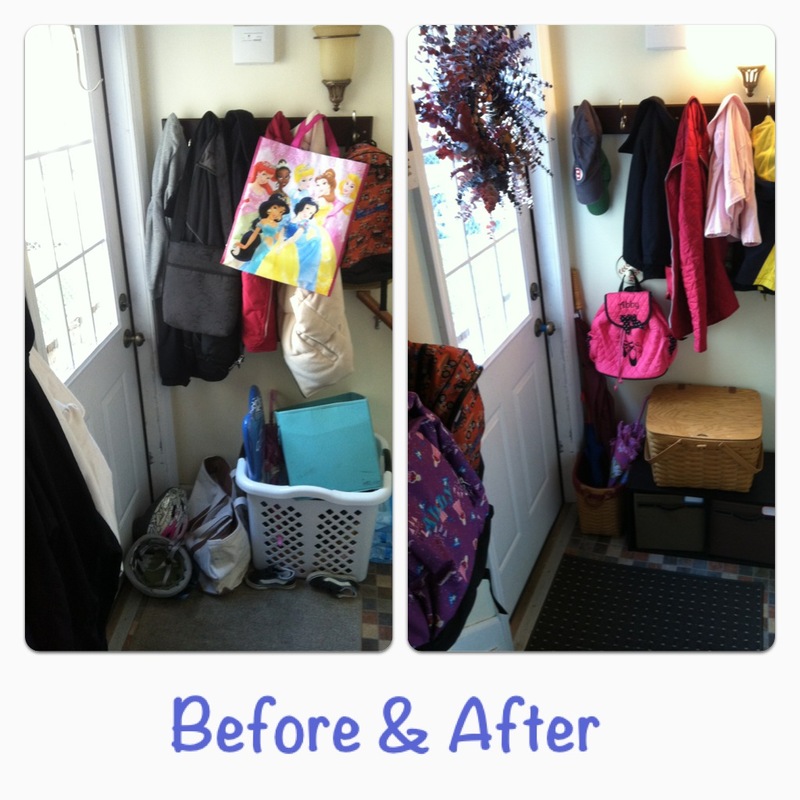 Is there an area in your home that wouldn’t take much to spruce up but keeps getting ignored? Take a look around at things you already have that you aren’t using. Maybe they will work to revamp another room in your home. You’ll be surprised what you find once you start looking around! Happy hunting!